All of our lures are ready to go! Just tie the lure on and start fishing! The sound activates once the lure is submerged in water. Pro Series lures with EBS Technology do not require any additional steps to program. Just tie the lure on and start fishing! The sound activates once the lure is submerged in water. EBS MultiTouch Technology allow you to choose the right sound for the conditions. 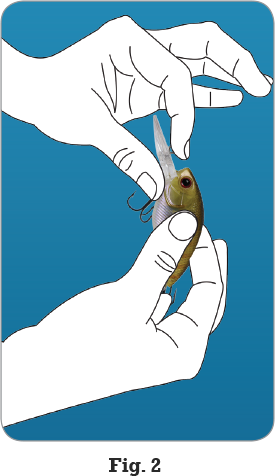 To power on the lure, submerge the lure in water and remove. Within 5 seconds, touch & hold Contact Points 1 & 2 (Fig. 2). Your lure will default to playing EBS Original. To select this sound, release both Contact Points. To select another sound, continue holding the Contact Points. By continuing to hold, you will hear a brief pause followed by the second sound, EBS Craw. By continuing to hold, you will hear a brief pause followed by the third sound, EBS Shad. To select this sound, release both Contact Points. By continuing to hold, you will hear no sound, Silent Mode. To select this sound, release both Contact Points after 4 seconds. You are now at the end of the cycle. In order to select another sound, repeat steps 1-4. 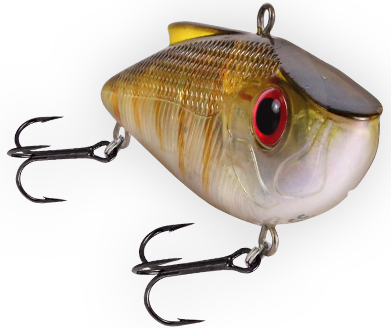 Your MultiTouch Livingston Lure will go into sleep mode if left motionless longer than 3 minutes. This includes in the water, in your tackle box, and hanging from your rod. To power off your lure sooner than 3 minutes, simply dry thoroughly and the lure will turn off. To reactivate your lure, simply go fishing! Your lure will awaken from sleep mode in the same sound that was last selected.